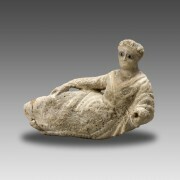 Datation : 14th - 13th century B.C. Category: Sculpture. Tag: Bottle with Spiral Decoration. 14th – 13th century B.C. Complete in good condition, some chips. Shine on the hat. 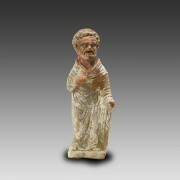 The statuette depicts a standing man, with a mask, which characterizes him as an actor. He is dressed in a large cloak. 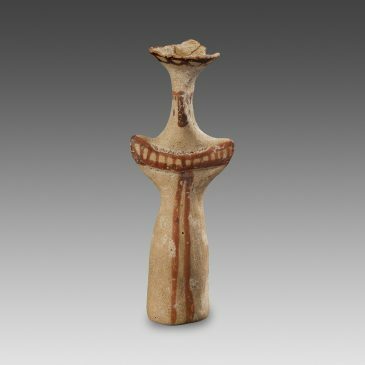 As it is usually the case at that time for terracotta examples, our figurine was molded in two parts, the front and the back. 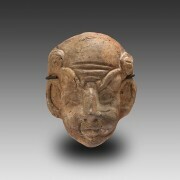 This face certainly represents a male figure; it shows some of the distinctive features of the Greek-Roman images known as “grotesque”, such as the big aquiline and pointed nose, the strongly marked, frowning eyebrows and the wrinkled forehead. 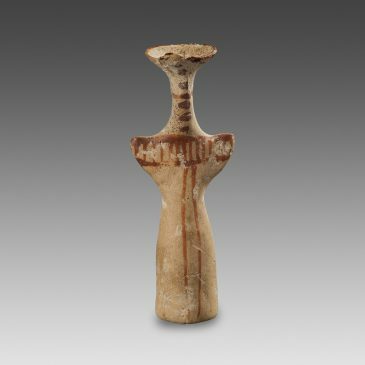 This statuette represents an adult, though beardless man with youthful features.